For billions of years, the Solar System’s asteroids have been involved in an endless game of bumper cars, smashing into each other and splintering into smaller bits. But get this—astronomers have just detected a clump of asteroids that has managed, quite miraculously, to stay intact since they first formed some four billion years ago. The discovery is revealing new insights into what our Solar System looked like during its earliest phase. 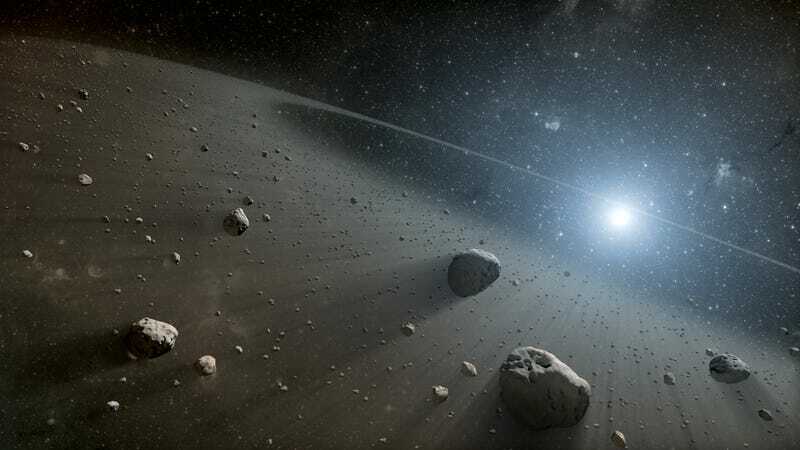 Of the millions of asteroids in the Solar System, around a quarter have been linked to over a hundred asteroid families. In the parlance of astronomers, a “family” of asteroids is a collection of space rocks with a common origin—a “parent” asteroid that fragmented after a collision with another rock. Such collisions are near certainties across cosmological timespans as these objects swirl around the Sun, the vast majority packed between Jupiter and Mars. To date, some of the oldest asteroid families known to scientists date back three billion years. But a new study published today in Science suggests there’s at least one family of asteroids that go back an additional billion years, to a time when the Solar System was just a baby. The study, headed by CNRS astronomer Marco Delbo’ and Southwest Research institute scientist Kevin J. Walsh, is providing new information about the formation of the early Solar System, and how matter was distributed during this primordial era. An obvious question to ask when it comes to this sort of research is: how the heck do astronomers know which asteroids belong to the same family? It’s not as if astronomers have access to a celestial family tree, or a time machine to go back and witness the collision that produced a batch of small asteroids. What’s more, many of these families are no longer clumped together, having drifted further and further apart over the eons. But this gradual process of drifting apart, called the Yarkovsky effect, is not random. As asteroids are gently pushed by the Sun’s radiation, smaller objects start to drift faster than larger ones. This size-dependent drifting produces an identifiable shape—a V-shaped pattern, which can be detected by astronomers on Earth. By measuring the diameter of the V-shape and performing some nifty math, the researchers can calculate how far back in time the original breakup happened. With the help of NASA’s NEOWISE team, Delbo’ and Walsh meticulously analyzed and cross-referenced asteroid data collected over the years, including observations made by the WISE space telescope, which measured the infrared radiation of over 150,000 asteroids. Looking at this data, the researchers were able to spot the characteristic V-shape pattern in the distribution of primordial asteroids that have been drifting unperturbed for billions of years, and away from where they originally formed. And in fact, the researchers discovered not one, but two types of old asteroids. The first were members of the primordial family which formed four billion years ago, before a period of great instability in the early Solar System when the giant planets drifted outwards into their current orbital position. These four billion-year-old asteroids are strewn across the inner part of the Main Belt, and include many dark asteroids not previously linked to asteroid families. The discovery allowed the researchers, by process of elimination, to remove all asteroids linked to families, leaving only a few rocks, all bigger than 22 miles (35 km) in diameter. In addition to the telltale V-shaped pattern, the complexion and size of the asteroids point to a common origin, and hint at the nature of the early Solar System. The large size of the asteroids suggests that big collisions happened back then which, surprisingly, was not a given. Exactly how large and how “stirred-up” the asteroid belt was four billion years ago isn’t really known, nor are the mechanisms that caused the violent motion of asteroids that lead to collisions. Another intriguing implication of the study is that this family of asteroids formed when the giant planets were parked in different orbits. Astronomers speculate that Jupiter, Saturn, Uranus, and Neptune formed in the inner Solar System, and then migrated outwards. Among the next steps, Walsh and Delbo’ would like to keep finding more families in the Main Belt. The very first population of asteroids defines a first and critical step in the formation planets, so the more we learn about them, the more we learn about the important processes required to form planets. Very cool findings, indeed. It’s weirdly comforting to know there’s a family that’s been around for four billion years.